Abuja — For the first time since the Department of State Services (DSS) raided the homes of some judges earlier in the year, President Muhammadu Buhari on Monday explained that the raid was not intended to intimidate the judiciary but purely in pursuit of his administration's anti-graft war. Buhari who commended the judiciary on the theme, described it as apt for this moment, adding that a "democratic system such as ours can not survive or prosper without strict adherence to the rule of law." According to him, the investigation of judges was not aimed at usurping judicial powers, pointing out that members of the executive and legislature have equally been investigated. Buhari who said the essence of government is to regulate social relations, added that the public expects fairness and speed from the judiciary but lamented the snail speed approach of courts to some matters before them. 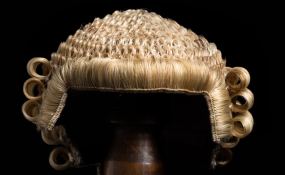 He also lamented conflicting cases of judgment delivery in Nigerian courts, saying it often leads to confusion and loss of confidence in the judicial system and tasked the judges to address the trend. The president who also spoke of the commitment of the executive to judicial welfare, tasked the judiciary to address decongestion of the prisons. "My lords, distinguished delegates, the prime purpose of any government is to regulate social relations within its territorial jurisdiction. Without the rule of law the government will degenerate into dictatorship or anarchy. "The theme you have chosen this year keys in with our administration's resolve to strengthen the three arms of government to effectively fulfill their constitutional obligations. "For the judiciary, the public expects fairness, impartiality and speed in the administration of justice. Regrettably, court cases can drag on for years and years, sometimes decades without resolution. I need only mention land cases in Lagos to illustrate my point. "Furthermore, there are huge backlogs of cases waiting to be dispensed especially at the Appellate levels. Reform of the judiciary should start at eliminating these seemingly endless delays in settling what to the layman are apparently simple cases. "Again, litigants expect that higher courts should endeavour to harmonise their rulings. There are contradictory decisions of superior courts on the same subject matter in cases where facts are substantially the same without a clear attempt in subsequent cases to distinguish the earlier cases. This lack of clarity leads to serious confusion to the lower courts. "The knock-on efforts of these delays and dis-continuities range from loss of confidence in the judicial system to over-crowding of prisons. This is an area Your Lordships should pay close attention to in your efforts at reforming the system. "Last month, I wrote to all state governors, urging them to make special visit to prisons in company with state chief judges and release prisoners unnecessarily detained without due process. "My lords, as all of us are aware one of the objectives of this administration is to combat graft and other forms of corruption so endemic in our public life. The executive can not achieve these objectives alone. "We require the close cooperation of other arms of government. "My lords, earlier this year the judiciary came under investigation. Let me again assure the judicial community, this action taken by the executive was in no way a prelude to usurping the powers of the National Judicial Council or aimed at intimidating the Judiciary as wrongly portrayed in some sections of the media. "Executive and legislative officials were also investigated am aware that the majority of judicial officers are learned and incorruptible and day in day out acting in the best spirit of their oath of office. "At the same time, I am quite aware, of the problems besetting the Judiciary including under-funding, inadequate personnel and absence of modern technological aids. "Bearing these in mind, this administration increased allocation to the Judiciary from N70 billion to N100 billion in the 2017 Budget. A similar figure has been proposed for 2018." "Mr. Chief Justice, our administration's commitment is to accord the judiciary its constitutional rights. I therefore commend your recent decision to ask all judges at lower courts to provide you with a comprehensive list of all corruption and financial crimes in order to designate special courts to handle them. I support your action and the public is awaiting the results of this initiative," Buhari stated.